This would make a great gift idea for your holiday shopping list! You can grab the Mr. Dusty The Super Duper Toy Eating Garbage Truck for only $26.46! You will be saving 34% on this purchase because it is normally $39.99! This fun toy has 3 ways to play! He can eat it up, sweep it up & dump it out! This picks up small toys (Building Blocks, toy cars, etc.) & comes with a has personality with over 50 phrases, lights, & sounds. Make sure that you grab this deal on Amazon soon because the prices can change at anytime on Amazon! CLICK HERE TO ORDER Mr. 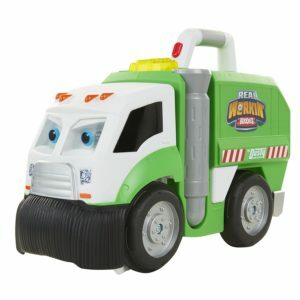 Dusty The Super Duper Toy Eating Garbage Truck for only $26.46 today!